gluten in our diets let’s not forget that there are people who truly cannot and should never eat foods that contain gluten. In my experience, there’s a range of tolerance to gluten just as there’s a range of tolerance to dairy products, “nightshade” vegetables and others. In the last few years I’ve made two friends who are in the gluten intolerant range. It’s not a choice for them; they get sick if they eat gluten. In our household breakfast is a special meal. 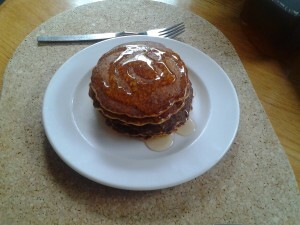 In the morning my husband, a breakfast fanatic, prepares a delicious meal and everyone sits down to enjoy it together. It’s not fancy or elaborate every day, but some days it’s spectacular. When our girls were young we were still in the rat race. So these beautiful breakfasts were relegated to weekends and holidays only. Now that the girls have households of their own, everyday breakfast has reverted to its former glory. Of course, you have your own breakfast favourites. You may eat the same thing every day of the week and be thankful you don’t have to make any decisions that early in the morning. We eat a variety of breakfasts. And a variety of breads for breakfast: whole wheat loaves, pancakes, French toast, English muffins, croissants, bröchen, bran muffins, bagels – the list seems endless. My gluten intolerant friends can eat none of these things, as we make them, because every one of them contains wheat. As you can see, it’s challenging for us to make a gluten free breakfast. So, I’ve started to try adaptations of some quick breads to serve for gluten free breakfast. Corn pancakes combine the urge to put good food in front of my friends with my love of corn bread. My mother made great cornbread she called Johnny Cake. It was served as a dessert, in shallow bowls, split open and smothered in butter and corn syrup. Her cornbread was light and gritty with a hint of crispness in the bottom crust. Eating cornbread is one of my best childhood food memories. With the glories of a full breakfast in mind, here’s the recipe I’ve adapted from the good old Joy of Cooking, by I Rombauer and M Rombauer Becker. Place corn meal in a heat-proof bowl, add salt and sugar, stir in water and let stand 10 minutes. In a small bowl, beat eggs, milk and oil and add to corn meal mixture. Sift corn flour with baking powder and mix into batter. Use no more than ¼ cup/60ml batter per cake. Pour onto a hot griddle, turn when bubbles break over the whole surface. Cook until golden brown on the bottom. 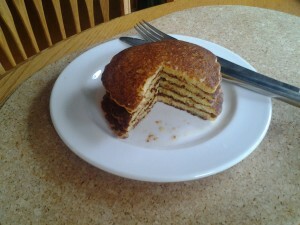 Serve in short stacks, layered with corn or maple syrup. Tip – Test whether your griddle or pan is the perfect temperature for cooking any sort of pancake. Heat the pan or griddle on medium-high. Take a few drops of water on your fingers and sprinkle them over the surface of the pan. If they sit and bubble slowly, the pan is not hot enough. If they sit or slide sideways and boil away quickly, the pan is too hot. If they jump and dance over the surface of the pan as they evaporate, the pan is just right. 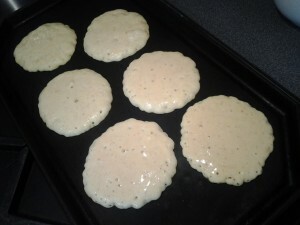 Although these are gluten free breakfast pancakes, I think they make a great dessert torte when made ahead, allowed to cool, and stacked in layers with corn or maple syrup. Make them about twice as big as for breakfast and make sure they’re cooked right through. It’s ok if they come out a bit dry since you’re going to soak them in syrup. You may have to thin very thick corn syrup with a tiny bit of liquid to make it soak in. You could use water, fruit juice, rum or brandy. Cover the resulting cake and allow it to stand at room temperature for a few hours. Slice and serve plain or with whipped cream sweetened to taste. Got any tips for making gluten free breakfast? What are your favourite food memories? Add to the Blend with your ideas and suggestions!